After a week of swings driven by the surprise election of Donald Trump and speculation over OPEC’s intentions, oil prices were back where they started. Futures slipped 1 percent on Friday, bringing them roughly in line with their close on Nov. 4. The International Energy Agency, the Paris-based adviser to some of the world’s biggest economies, said it’s waiting to see whether President-elect Trump’s rhetoric hardens into action before revising its market forecasts. Prices may retreat amid “relentless global supply growth” unless the Organization of Petroleum Exporting Countries goes ahead with significant production cuts, the agency said. Oil has slipped below $45 a barrel following OPEC’s failure last month to agree on output quotas for member countries. Targets must be agreed upon before the group’s deal to cut production can be finalized at a meeting in Vienna on Nov. 30. While investors took comfort from Trump’s conciliatory acceptance speech on Wednesday, rising U.S. crude supplies served as a reminder of the inventory overhang. “The oil market — as most other financial markets — appears to dismiss some of Trump’s threats to renegotiate the nuclear deal with Iran and make the U.S. independent from OPEC oil imports,” said Carsten Menke, head of commodities research at Julius Baer Group Ltd.
West Texas Intermediate for December delivery lost as much as 49 cents to $44.17 a barrel on the New York Mercantile Exchange and was at $44.38 as of 9:43 a.m. in London. The contract lost 61 cents to $44.66 on Thursday. Total volume traded was about 17 percent below the 100-day average. Prices are up 0.8 percent this week. Brent for January settlement fell as much as 0.7 percent to $45.50 a barrel on the London-based ICE Futures Europe exchange. The contract fell 52 cents to $45.84 on Thursday. Prices are 0.3 percent higher this week. The global benchmark traded at a premium of 62 cents to January WTI. Non-OPEC producers such as Brazil, Canada, Kazakhstan and Russia will raise output by 500,000 barrels a day in 2017, after enduring their biggest slump in more than two decades, the IEA said in a report. OPEC meets in Vienna at the end of the month as Iraq seeks to be excluded from cuts because it’s embroiled in a war with Islamic militants. Rosneft’s oil and gas output rose 1 percent to 4.15 million barrels a day in the quarter from a year earlier as the company increased development drilling by 42 percent in the first nine months of the year. 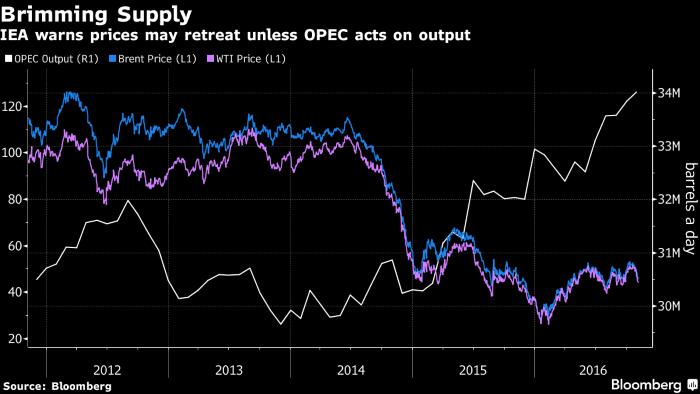 The probability of OPEC implementing output cuts is low because the group has fragmented as members seek exemptions, according to Abhishek Deshpande, chief energy analyst at Natixis SA. Petroleo Brasileiro SA’s loss widened in the third quarter as the state-controlled oil producer posted a 15.7 billion-real ($4.6 billion) impairment related to currency swings and declining prices.